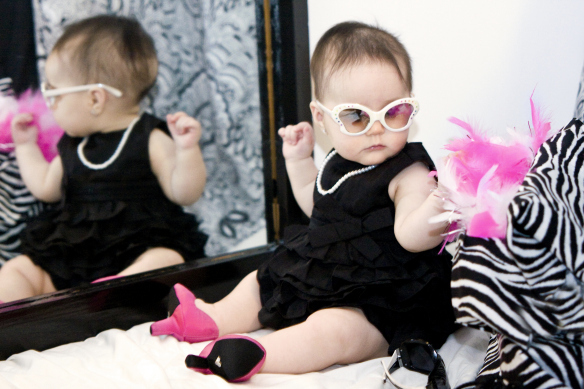 High heels for toddlers are now a $4 billion dollar industry world-wide. Girls aged 3-8 can&apos;t get enough of the fashionable spikes, kitten heels, wedges and boots. Yes they look cute and snazzy, but should toddlers be wearing them? Wait ... this isn&apos;t just another post about how society is sexualising children. Kids have always played dress-ups. Little girls (and many boys) walk around their home wearing mum&apos;s shoes, often complete with feather boa and fake nails. It&apos;s not a big deal. The real problem lies in the fact a child&apos;s foot hasn&apos;t finished growing and wearing heels can damage the growth of their foot. 1. Toddlers fall over, a lot. Most toddlers can&apos;t sit still. They run, jump, laugh and play. They also fall over, a lot, while wearing flat shoes and even while wearing no shoes. Imagine how often they&apos;d fall over in heels? Podiatrist Gregor McCoshim told all4women.co.za little girls are prone to twisting their ankles while wearing heals, particularly if the heel is above 2cm. A child&apos;s feet don&apos;t stop growing and developing until they are 14 and this is the acceptable age for children to start wearing heels. This is the same reason they shouldn&apos;t wear shoes that are too pointy. Heels worn too often will change the shape your child&apos;s foot develops. They either need to wear completely soft shoes, properly fitted shoes or no shoes at all. When a little girl wears heels they stand differently, with their head and top half bent lower to compensate for the heel. This can cause strains in the back which can ultimately affect their grown, development and posture. Toddlers who wear flat shoes or no shoes naturally stand taller. When toddlers are allowed to roam barefoot as much as possible this allows the foot to develop properly. Podiatrist Tracey Byrne has told all4women.co.za, "Walking barefoot develops the muscle ligaments of the foot, increases the strength of the foot&apos;s arch, improves their awareness of where they are in relation to the space around them, and contributes to good posture." Some toddlers have been known to develop bunions and other sores as a result of the excessive wearing of heels. They just aren&apos;t comfortable, not matter what our age and toddlers are less likely to understand that most heels need to be "worn in", where as adults are more likely to accept minor injures as the price we pay for wearing beautiful shoes. Kids will be kids and they should feel free to run, jump and play and be children. If they are allowed to focus too much on dressing up they lose that innocence and can become too focused on their looks. By limiting heels and makeup and glittery nail polish to fantasy games, it allows little girls and boys to have fun without them becoming too attached to it.